Buchty, fluffy baked buns of deliciousness, filled with a surprise of jam, cheese, nuts, or poppy seeds, are to me the quintessential Slovak treat. They are the Slovak cookies. Not that they taste anything like cookies, but just like this American staple, every family has its own secret recipe. And you can always count on there being a tray of freshly-baked buchty when visiting your grandparents. And now you can experience this bliss, totally free. So what’s the catch? A-ha, you are right, there is a catch of sorts. In exchange for buchty, I want you to help me promote slovakcooking.com. How is up to you, but here are some examples. My idea is that you write an article about slovakcooking.com for your blog or a local newspaper. So this giveaway will work best for bloggers, but even if you don’t have a blog of your own, maybe you know someone who does – and you guys can share. You don’t have to be nice: feel free to say that slovakcooking.com is the worst recipe site on the planet or that I (Lubos) have no idea how to cook. However, I ask that the article is published in a forum that in some way pertains to this site. In other words, an article on a site dealing with, let’s say, cars or video games, won’t cut it. You run a cooking site. You prepare some recipe from slovakcooking.com and talk about it and also leave a link to the original recipe. Your site is dedicated to world travel. You mention in the article that folks wanting to learn more about Slovakia and Slovak culture (especially the culinary kind) can do so at slovakcooking.com. You have a site dedicated to language learning and you link to the Slovak lessons on this site (I swear, I’ll update them soon!). You write newspaper articles about sustainable living. You can talk about the differences between modern and traditional cooking in places such as Slovakia, when people were much better at fully using up all pieces of food. Your site is dedicated to world cuisines. You can write an article about the traditional foods of Slovakia. (feel free to send me an email if you have any questions). After your article get’s published, simply leave a comment here telling me where I can find it (This is also a good way to promote your own blog). Please use email address at which I can contact you off-site to get your mailing address. Depending on the turn out, I plan to bake the buchty about every two weeks. After that, I’ll mail you a batch of six, totally free. USA only, sorry! International shipping is simply too expensive. Finally, fine print because you always need to have fine print. Buchty are made of flour, yeast, milk, and sugar, and will be filled with poppy seeds, nuts, or plum jam, in case you are allergic to any of the ingredients. My favorite kind is the one filled with farmer’s cheese, but to prevent spoilage en-route, I won’t be making any of those. This giveaway is open until March 1st. The whole article should be at least 2 paragraphs long and needs to contain a link to this site, if posted on a website. I (Lubos) reserve the final judgement on whether the entry is acceptable so if you have any doubts, shoot me an email. But as long as you adhere to spirit of the examples, you’ll be fine. Each eligible participant will receive a batch of six buchty of assorted filling. Ahoj Lubos, ako ty uz vies, napisala som par slov o tvojom blogu a super napade predstavit slovensku kuchynu svetu. Nebyvam vsak v USA, takze buchty od teba nebudu 😉 ale ak by si to niekto chcel precitat, moze tu http://ssalonis.blogspot.com/2011/01/predstavujem-vam-blog-slovak-cooking.html Pozdravujem a tesim sa na dalsie slovenske recepty na tvojej stranke. I must have missed it. Where is the recipe for the Buchty dough? Thanks. 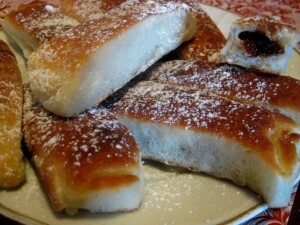 It’s linked as “leavened dough” under ingredients, http://www.slovakcooking.com/2009/recipes/leavened-dough. Am so happy a dear friend sent me your web site-I still make some Slovak cookies for Christmas and Easter as instructed by my mother. Most of my relatives are now gone and now I have a place to look for some of the older receipes of foods that I remember eating as a child. I was so happy to come across this site. My son is a cub scout and tomorrow night is language and culture night. I had to make a snack from his heritage. Since many in our area are Irish and Italian and will probably bring common snacks we thought we’d touch my husband’s Slovakian side. What fun it was to make langos for my family as a trial. We loved it. Tomorrow night is the test when a bunch of cub scouts will be sampling different snacks. I’m not so sure about my international cooking. At least I’m enjoying it. Thank you, Melissa! Feel free to leave a comment with your questions. I get an email whenever somebody leaves a comment so I read them all, even if I don’t respond to all. The best place to leave it is on the recipe page for the particular dish you have a question about. And if the dish is not yet posted, you can leave the question on the “Slovak Food” page, http://www.slovakcooking.com/favorites/. Or just email me… Either way works. Hi Melissa, I live in Indiana, very few Slovaks here, I too am part Slovak, and my grandparents came from Eastern Slovakia near Hummene’ . Just try to write us a phonetic spelling of the towns. Lubos, where did you get the idea? I am hoping there can be some discussion on Easter traditions…we always do a (blessed) ham with bolied eggs, diff meats and sausages, an easter “cheese” made with sugar and eggs, an easter bread that I cannot get anywhere in VA, but my mom gets in western PA…pickled eggs (the beet n vingar kind). Does anyone have these or simlar traditions? I hope that my translations are close – my family was all German and Swedish! Lubos, this promotion of yours is a great idea – I hope that it catches on! I also tried your Pečené Zemiaky s Kyslou Kapustou, but wasn’t able to get any photos. Another good one! There are many other recipes that I want to try; first among them is your makovník a orechovník, since my wife says that your recipe is exactly the same as the ones that her grandmother made, except her grandmother called them koláče. I also want to try both of your sausage recipes and many of the dessert, bread and holiday recipes. Thanks for a resource for Slovak cooking that is clearly head-and-shoulders above the rest!